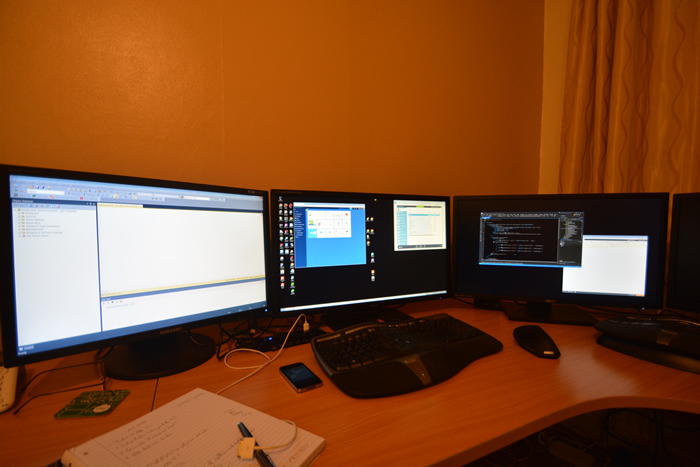 As I explained back in January when I purchased my first 4k screen and blogged about it then with 4k Screen, Developer for the User Of, a developer cannot have enough screen space and also real desk space to work with. I have retained a 1920 x 1200 screen in order to focus on one (Visual Studio or SSMS) window, but the other screen serves as desk space rather than having everything minimized and more difficult to get at. Since moving house last week I have wired up my two dev PC’s in such a way that the 4K screens can be used by either PC (they typically have multiple inputs and can either do split screen or full screen on one of the inputs).